Special features: Named after Eleanor Glanville, the 18th century amateur naturalist. 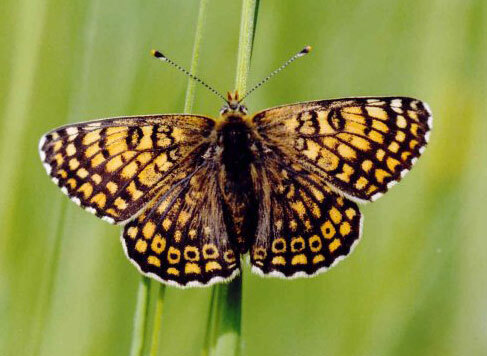 The hind wings feature a row of black dots inside orange spots which make it distinctive from similar species like the Marsh Fritillary. The undersides of the wings are decorated just as beautifully as the upper surfaces. The black caterpillars, which have short hairs along their bodies, and brown heads, feed on plantains. The butterfly is sometimes called the 'Plantain Fritillary on account of this. They can sometimes be found basking on top of a silk web which they spin over their foodplants. Distribution: Scarce. Found on the Isle of Wight and The Channel Islands. Months seen: May to June. Habitat: Fields with fairly short grasses - often close to the sea. Generally on sandy soils. Food: Nectar. The caterpillars feed on plantains.